Reading our Lonely Planet trekking guide there weren’t any decent lodges and stopovers between Chame and Upper Pisang. So that would result in either a long day of about 8 hours or a short day followed by a shortish day. We weren’t in any rush so we decided we’d stop in Chame after about half a day of walking. Plus Harry, our porter also agreed. 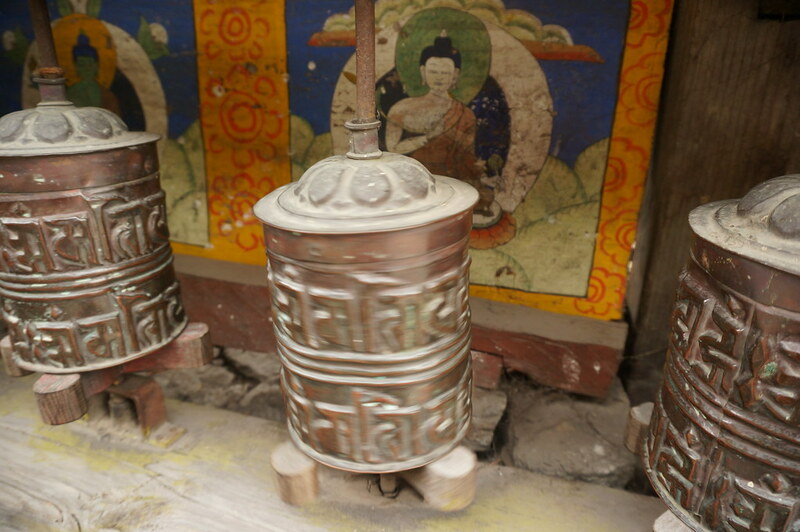 Before leaving Danaque we turned the prayer wheels for good luck and good weather. The weather stayed rather cloudy that day so I’m not sure we turned them properly! Harry took us up a short cut as the road was just switchbacks here. The shortcut was incredibly muddy and steep but we made it up without any slips. Harry, carrying about 20kg, went up with ease, as if he had no weight on his back. We walked along the road for a few minutes and over a ford with stepping stones for trekkers. Then it was a long steep uphill walk through the woods on the path. The path levelled out to a steady but gradual incline and we walked for a while through the woods until we reached another steep uphill section. 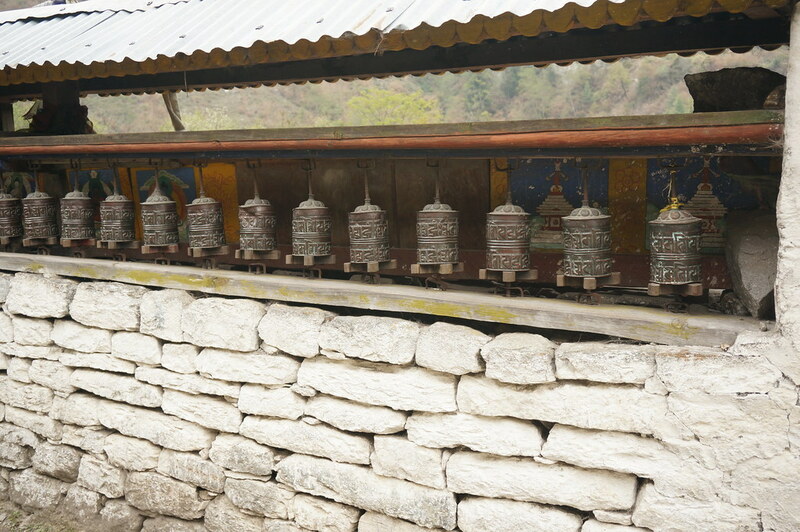 Not long afterwards we reached the village of Timang, described in the Lonely Planet as a ‘scruffy settlement’. It looked OK to us and had a pretty well stocked shop. It has been 3 years since the Lonely Planet team had visited. The village now consisted of many lodges for tourists but once again seemed devoid of any actual tourists. From Timang we were back on the road. The road was pretty much deserted and cut through the forest, making it a pleasant walk. Remember that the road is little more than a wide dirt track, more like a supersized footpath than a road. We stopped for a tea break and met another British couple, who had been away from the UK for about 2 years. They were from Rawdon, which is about 5 minutes from where we had lived for the past 5 years. They claimed to have given up on the traditional lifestyle and did want to live in a materialistic world. An interesting chat as we had rather different views on things, but it’s always interesting to hear a different opinion even if we don’t agree with it. We then followed a footpath which depressingly went steeply downhill, over a suspension bridge then steeply back up the other side. Although we are used to seeing this setup it’s still a depressing sight to know that every footstep down will be matched by a step back up in a few minutes. 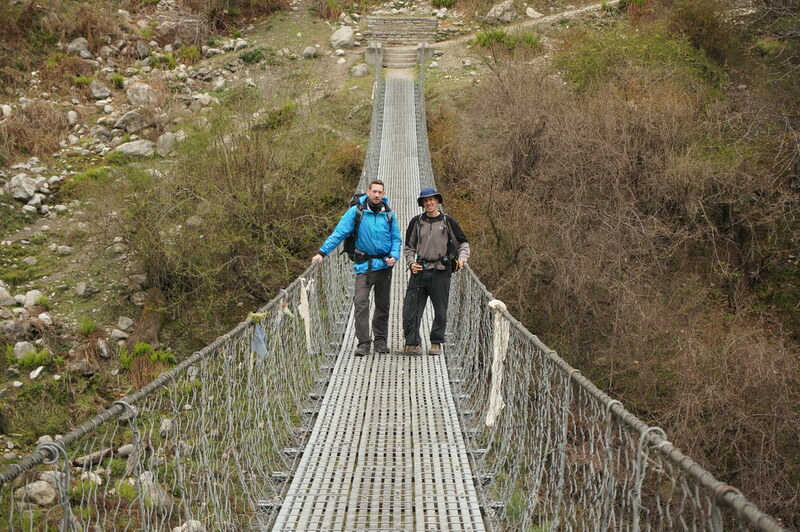 Still, we made the most of it by jumping and bouncing on the suspension bridge (after posing for a photo). At the top of the slope, perched on the edge of a cliff which is rapidly crumbing into the valley below, is a traditional village called Thanchok. The village is almost untouched by time and tourism. Consistinf of old stone buildings, animal pens by the narrow stone path through the village and dry stone walls. The only sign of modernity wasthe communal tap for washing and drinking, oh and the tourist lodges at the end of the village. Surrounding the village were the most vividly green fields we have seen since the Phillipines at least! At the end of the village was a lodge, which was a good thing because the pot of tea we’d drunk earlier had now passed through us and we really needed a toilet! 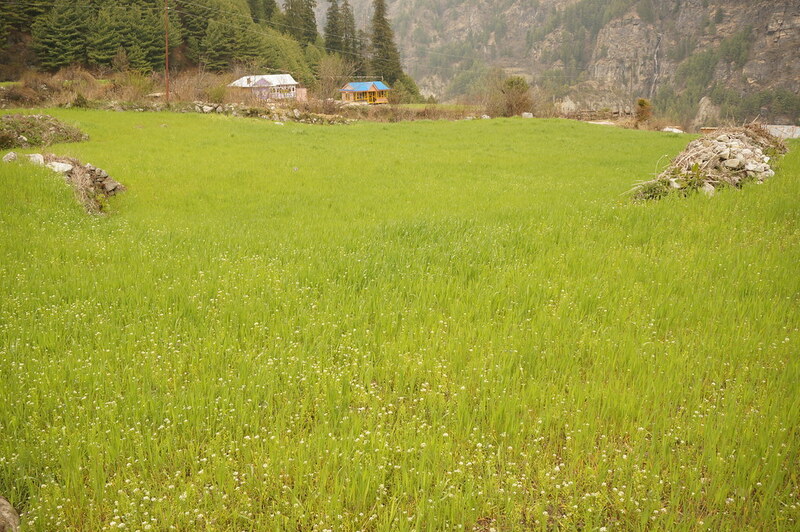 From Thanchok we rejoined the road and walked along it through the woods until the village of Koto. This section was uneventful apart from the local man who befriended Annemarie and walked with her for about 20 minutes. This was because Annemarie insisted on walking faster than me and Marco – she complained we were walking too slowly. When Annemarie stopped for us to catch up he took a rest, then when I left the walking pole behind after a short stop he did his shoelace up whilst everyone waited for me to go back and get the pole. Then when we stopped to take off a layer because of the warmth his other shoelace needed tightening. Harmless and amusing. In Koto we stopped at the police checkpoint to have our permits checked and we met the British couple again. We’d seen them leave Danaque about an hour before we left (they walked past our lodge just as we were walking out of our room to have breakfast). They were a bit paranoid that we had walked that much faster than them but were relieved when they discovered we hadn’t had lunch yet. They had stopped in Koto for lunch. The guy was still talking about how much better it must be for us carrying only a small day bag and how much faster we must be. Then asking if it takes away any sense of achievement. Well, he’s right that it’s much easier with a small bag, plus we’re faster and not as tired at the end of the day. That makes the trek a much better experience in my opinion and far more enjoyable. As for the achievement, well, I don’t have to show off to everyone that I carried a big heavy bag over the pass, I’m happy enough just to say I was there. He walked fast to try and get ahead of me (Annemarie was already a good 50m ahead) but I could easily out pace him and it wasn’t long before I was back with Annemarie and Marco. 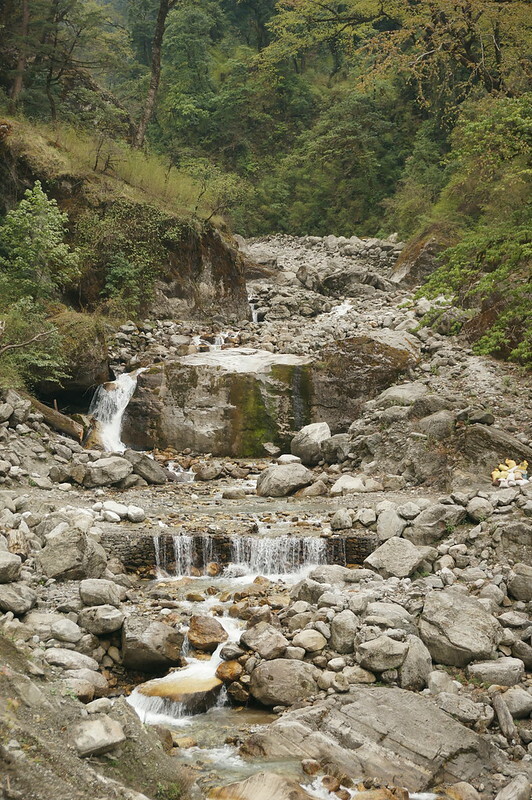 In Chame we were expecting a huge selection of amazing lodges as this is now the unofficial start of the Circuit and most trekking companies will bring trekkers this far by Jeep. Our high hopes were soon dashed. The first lodge we looked in was OK, it had attached bathrooms (a toilet and sink) and a gas shower downstairs. We decided to look at another lodge recommended by the Lonely Planet, but that was at the other end of town which was about a 10-15 minute walk. The other lodges were in a better location, near the river with good views, but the rooms were dingy and Annemarie wasn’t too keen on the owners as they weren’t as friendly as she wanted. They didn’t seem to care about guests, so we left. We looked at another in the middle of town but again the rooms looked horrible and the toilet was a long walk across the garden. Another we looked at seemed OK, but again the toilet was across the yard. Eventually, after about an hour of wandering we went back to the first lodge and requested the room for free so long as we ate lunch, evening meal and breakfast there. She agreed as the lodge was empty. We had a large lunch as Annemarie ordered chips for me, then crossed it out and ordered veg fried rice (which was what I wanted), but they brought both. We shared the chips but we were stuffed after eating all of that. We wandered around the town but there really wasn’t much to see. We found a large concrete tub which probably used to hold water from the hot spring. Now it holds only plastic bottles and empty cigarette packets. A couple seemed to have found the hot spring as they lay, almost naked, between some large rocks on the edge of the river. How they found that exact shallow spot of water I don’t know, but they were glowing red so I guess the water was nice and warm. 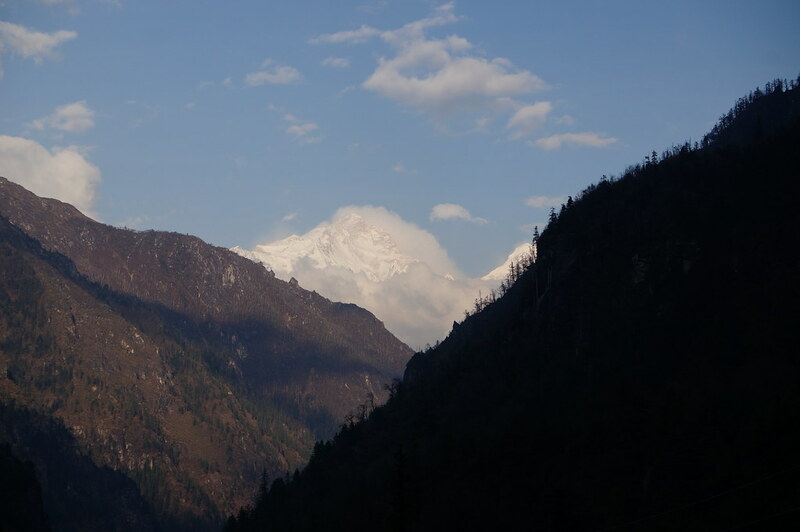 As we wandered back through the village we got a reasonable view of Manaslu (8th highest peak in the world). Back at the lodge we met two girls, Nina from Germany and Madeline from Switzerland. They had been volunteering in Nepal before the trek. We talked with them and a guy from Venezuela (I think) who was with a Spanish woman. They were carrying almost nothing, stated they didn’t carry water because it slowed them down, preferred to walk 10hr days (or longer) and knew almost nothing about altitude sickness. We thought they were a little bit crazy but they claimed to trek lots in South America so we have to assume they have some idea what they are doing. We read until about 8:30pm then went to bed because the light was quite bad for reading.